Training and education in Kenya is seen as a lifelong endeavour that aims to provide an individual with relevant skills for better employment. To achieve that, learners need to develop the ability to learn rapidly and to be innovative, whereas trainers need to become more adaptive to the changes in technology. Mobilise resources to rehabilitate facilities in public TVET institutions. Education and training in Kenya are governed by the Education Act (1968) which gives policy guidelines on the establishment and development of institutions, their management and administration, development of curricula, and teacher education. Vision 2030 is an important country development document that among other things places great emphasis on science, technology and innovation in general and TVET in particular as the vehicle for socio-economic and technological transformation. The Sessional Paper №1 of 2005, a Policy Framework for Education, Training and Research, was formulated to articulate specific objectives and strategies for each level of education and gave an impulse to specific subsector policies and reforms. The National Skills Training Strategy and the revision of the legal framework for TVET (TVET Bill) were meant to strengthen the mechanisms for the implementation of the necessary TVET reforms. TVET Bill of 2012 contains rivision of legal framework in the TVET sector and provides for the establishment of a TVET Authority to oversee the TVET system. Kenya Qualifications Framework Bill (2012) provides for the establishement of Kenya Qualifications Authority and its functions. John Nyerere (2009). 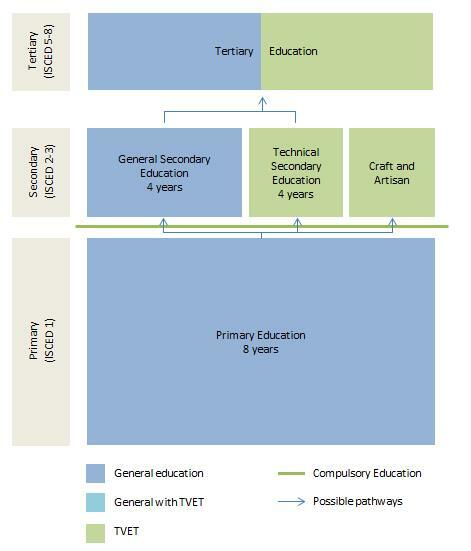 Technical and Vocational Education and Training (TVET) Sector Mapping in Kenya. Amersfoort: Edukans Foundation. UNESCO-IBE (2010). World Data on Education VII Ed. 2010/11. Kenya. Geneva: UNESCO-IBE. Scheme compiled by UNESCO-UNEVOC from UNESCO-IBE (2010). World Data on Education VII Ed. 2010/11. Kenya. Geneva: UNESCO-IBE. Since 1984, the structure of the education system in Kenya has consisted of eight years of primary education, four years of secondary education and four years of tertiary education. It replaced the 7-4-2-3 structure and was meant to introduce a broad-based curriculum that would provide learners with pre-vocational skills and technical education. The education and training system in Kenya offers a wide range of vocational and apprenticeship programmes. The TVET subsector provides parallel opportunities either as alternatives to the general education or as after-school training (Chen, Hamilton, Kamunge 2004). These innovations were introduced to offer equal opportunities to the learners to advance to the highest level of learning, through either the academic or TVET channels. The structure also provides flexible mechanisms and opportunities for entry and re-entry into either channel. TVET programmes are also offered by other institutions spread across government ministries as well as over 1 000 private institutions, that offer courses in computers and non-technical areas of training. Kenya has recognised the need to link training to employment. That is why enterprises are being well involved in determining the content of training, so that the content of training is more relevant for young people and the workplace. Furthermore, entrepreneurship has been integrated into TVET education and training as part of the curriculum to provide trainees with business techniques (Simiyu 2010). Youth polytechnic Programmes provide a non-formal training to unemployed school-leavers in skills related to local income-generating opportunities. Within the informal sector, a training system based on the apprenticeship model is thriving. It is estimated that the sector provides training to more youth than all the formal systems put together (A. Ferej, K. Kitainige, Z. Ooko 2012). The informal (traditional) apprenticeship system in Kenya was born with the Indian craftsmen imported by the British Colonial Government to construct a railway line linking the seaport of Mombasa with the interior of the country (King 1977). People from the local communities worked alongside the Indian craftsmen as labourers on the construction projects and gradually acquired enough trade skills to work as semi-skilled and, later, skilled workers. In Kenya, the informal sector is known as Jua Kali, in Swahili “hot sun”, which came to be used for the informal sector artisans who were working under the hot sun because of a lack of premises. The sector now encompasses small-scale entrepreneurs and workers who lack access to credit, property rights, training, and good working conditions. Originally restricted to artisans, the term has come to include a number of professions, including auto mechanics and market vendors (Orwa 2007). Local voluntary associations started emerging in the 1980s as true advocates on behalf of these informal businesses. These associations work in the community to identify problems, propose solutions and act on them. Through associations, Jua Kali artisans have access to knowledge and skills to enable them to improve on their products and services. For example, Kamkunji Jua Kali Association, considered to be the pioneer of the Jua Kali movement in Kenya, helps improve the technical and managerial skills of members through training. In 2005, the local Jua Kali associations created and registered the National Informal Sector Coalition (NISCO) to address the problems inhibiting the development and growth of the Jua Kali sector (Orwa 2007). Informal skill training in Kenya has been featured by its relative ease of entry as the informal apprenticeship in Kenya has no rigid rules or time constraints about the duration needed to learn a trade (Ferej, 1994). The Kenyan apprenticeship system has also flexible fees and a low regard for formal certification. Non-Governmental Organisations (NGO) play a major role in the TVET informal sector. In the 1990s, the Kenyan NGO SITE (Strengthening Informal Training and Enterprise) implemented in collaboration with Appropriate Technology (APT UK) the Skills Upgrading Project (SUP) to: (i) upgrade the technical and managerial skills of mastercrafts(wo)men/trainers, (ii) strengthen their capacity to provide quality training to their apprentices, and (iii) strengthen the capacity of selected vocational training institutes to support mastercrafts on an ongoing basis (Haan 2006). In total 420 host trainers were trained and 1400 apprentices received improved training from the trained host trainers. Ahmed Ferej, Kisilu Kitainge and Zachary Ooko (2012). Reform of TVET Teacher Education in Kenya: Overcoming the Challenges of Quality and Relevance. Tunis: Association for the Development of Education in Africa. In May 2008, the responsibility for technical, tertiary and higher education was transferred to the Ministry of Higher Education, Science and Technology (MoHEST), which is in charge of most Technical, , Vocational Education and Training (TVET) institutions in the country. The Ministry’s mandate includes Science Technology Innovation (STI) Policy, research development, research authorisation and coordination of Technical Education (TE). Career guidance and counselling on matters relating to liaison between technical institutions and the industry. In addition to the MoHEST, TVET is provided by several government departments, including the Ministries of Defence; of Labour; and of Youth Affairs and Sports, the latter being responsible for Youth Polytechnics. In total, more than ten ministries are responsible for managing TVET institutions. Nevertheless, the Government has developed a blue print to establish an independent umbrella body which would coordinate all TVET activities under one organisation to be known as TVET Authority or TVETA. This blue print is yet to be approved by the legislation. Most TVET institutions are owned by the Government and funded through the direct involvement of 13 ministries in the sector. However, donor support plays an important role in TVET development. 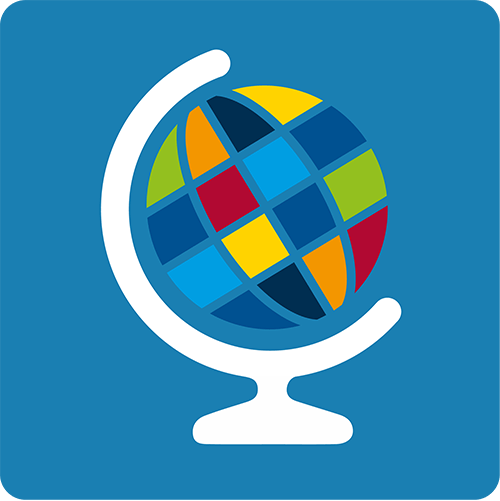 The large amount of international aid has contributed to the establishment of training capacity, like the creation of infrastructure and facilities, the training of staff and the implementation of instructional systems (Ferej, Kitainge, Ooko, 2012). John Wanyonyi Simiyu (2010). Factors influencing the attractiveness of a Technical and Vocational Education and Training Institution: a case study of a Technical Institute in Kenya. Eldoret: Moi University. Trainees initially obtain subject-focused specialisation and work experience in the industry before undertaking pedagogical training to become a TVET teacher. In order to increase the number of practicing TVET teachers, qualified technicians were also recruited from the industry to join the one year teacher training. Untrained technical teachers with appropriate skills may also join the programme for pedagogical training. Due to the difficulties associated with attracting qualified individuals for technical training, the government offers various incentives to the trainees. With the mushrooming of TVET institutions in the country (Institutes of Technology, Technical Training Institutes, private and Government Training Institutions, the four national polytechnics), the Kenya Technical Teachers College (KTTC) was created in 1978 to replace the programme of the Technical Teacher Training department at the Kenya Polytechnic. KTTC has been established under MoHEST with the primary objective of training technically skilled personnel, among which technical teachers to teach in secondary schools and tertiary institutions. Successful candidates are awarded with certificates, diploma and higher diploma. The Government established the Kenya National Examination Council (KNEC) in 1980 as the national body responsible for overseeing national examinations, and awarding certificates in both the formal and the informal sectors in Kenya. Formal education in Kenya has a system of nationally recognised certification from primary through secondary, post-secondary and tertiary levels of education and training. In the informal training sector, the government has established a mechanism for providing trade tests for certification at the artisan and craft level. Grade 3 corresponds to the initial qualification for artisans, followed by grades 2 and 1 culminating in master craftsman certification (Kerre, Hollander 2009). A national symposium held in November 2003 reviewing the status of TVET in Kenya recommended the implementation of a National Qualifications Framework, which is being developed by the Ministry of Higher Education, Science and Technology in Kenya. No institution shall offer a qualification that is not authorised by the Authority and accredited by authorised accrediting agencies. Strengthen national regulatory and quality assurance systems for education and training. And setting admission criteria for students joining Technical, Vocational Education and Training Institutions programmes. Ministry of Higher Education, Science and Technology (2012). Kenya Qualifications Framework Bill. Nairobi: Ministry of Higher Education, Science and Technology. Webpage of the Directorate of Technical Accreditation and Quality Assurance. Accessed: 10 August 2012. TVET Bill 2012 contains revision of legal framework in the TVET sector and provides for the establishment of a TVET Authority to oversee, manage and govern the TVET system including maintaining a register of all institutions accredited under this Act leading to high training standards. According to the National Report for Kenya (2008) issued by the Ministry of Education, challenges of Kenyan TVET include inadequate facilities and capacities to cater for the large number of those who complete primary and secondary education and wish to undertake TVET, together with the restricted ability to produce graduates with skills which are relevant to the industry. Above that lack of modern technologies in the industries leave the country unable to compete effectively on the world arena due to outdated training curricula of TVET prorgammes. The large informal sector complicates the situation since it absorbs most of the TVET graduates and at the same time is the largest skills training ground through its informal apprenticeships. Ministry of Education (2008). The Development of Education, National Report of Kenya. Nairobi: Ministry of Education. Ministry of Higher Education, Science and Technology (2012). Kenya Qualifications Framework Bill. Nairobi: MoHEST. Webpage of the Directorate of Technical Accreditation and Quality Assurance. Accessed: 10.08.2012.